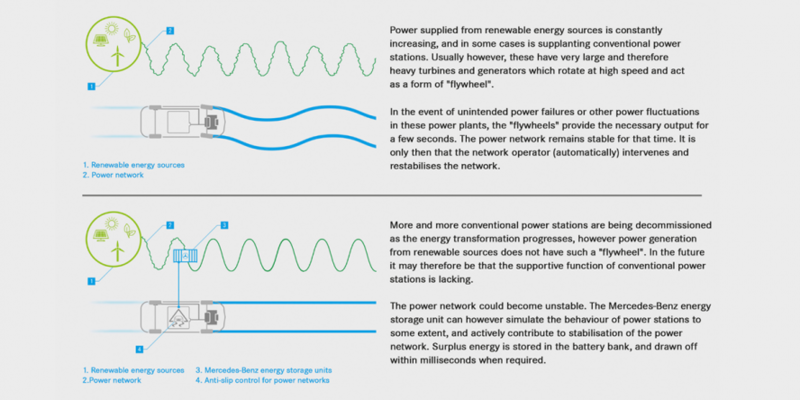 Transmission system operator TenneT and Daimler subsidiary Mercedes-Benz Energy have joined forces in a development partnership to see whether EV batteries could stabilise large grids. 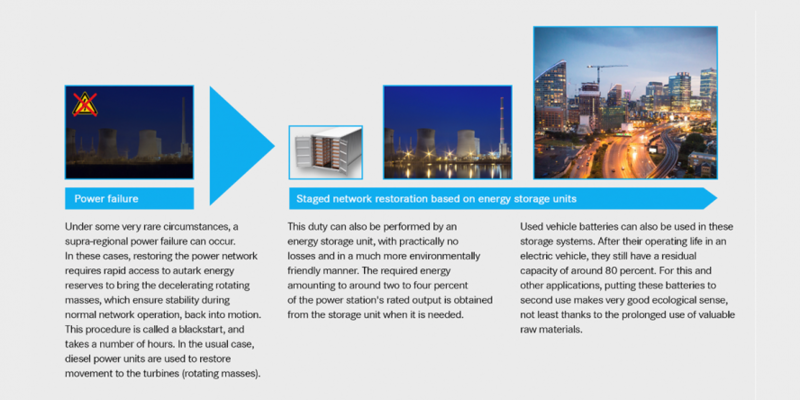 The result: Automobile battery storage systems can indeed make a significant contribution to grid stabilization and system reconstruction. 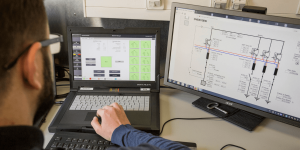 The study was carried out within the framework of the Enera project as part of the ‘Smart Energy Showcases – Digital Agenda for the Energy Transition’ funding programme by the German Federal Ministry for Economic Affairs and Energy. Resulting from this cooperation, the researchers have shown that automobile battery storage systems “can help to compensate for the loss of conventional energy generation,” should the electrical grid fail for some reason, according to Daimler. By kick-starting the energy grid with the additional stationary energy storage, fluctuations can be dampened and frequency deviations covered. For the duration of the project, a test facility was set up with 1 MW capacity and 750 kWh storage near Kamenz, Germany reportedly. Utilizing this facility, the partners managed to prove “that automobile battery storage systems can respond to a changing frequency in less than 100 milliseconds”. Moreover, the researchers found that such battery systems can help kickstart large-scale power plants, a task that is currently done with diesel generators. Clearly, batteries would provide a more environmentally friendly approach, as well as providing a stronger basis for an intelligent energy system. According to the partners, the next step will be to “define the requirements that will enable a tender process for the future system service by TenneT”. What has commonly been called a “black start” of a generation plant that goes down is interesting to say the least. A coal fired plant trips offline, even IF the operators find and clear the fault in minutes, the plant trips offline and a cascading grid fail is in force. One has to “gauss up” the transformers and generator windings in order to start up the generator once again. The black start would be the worst of the failures one could encounter. The TESLA energy storage system installed across the Neoen wind farm in Australia has proven its worth when one of the old coal fired plants suddenly tripped offline. The energy storage with the wind farm kept the grid up and running while the fault was cleared and the plant brought back online.